Does your business need commercial auto coverage? Like many small business owners, you may assume that your personal auto policy affords all the coverage you need. You may also believe that your policy will protect you if you are involved in an accident while driving a vehicle you use for business. As this article will explain, you could find out the hard way that your assumptions are wrong. A personal auto policy is designed to cover individuals, not business entities. It typically defines insured as the individual named in the declarations and that person's spouse and family members. Obviously, the terms spouse and family members are not relevant to a business entity other than a sole proprietorship. Note that if your business is a sole proprietorship, you can insure your family members under a business policy via the Named Individual Insured Endorsement. Commercial Auto Exclusion Many policies exclude the use of a vehicle by someone employed or engaged in a business other than farming or ranching. This exclusion doesn't apply to a private passenger vehicle or to a small pickup or van not used for delivering or transporting goods and materials. Generally, a truck or van is "small" if it has a gross vehicle weight under 10,000 pounds. 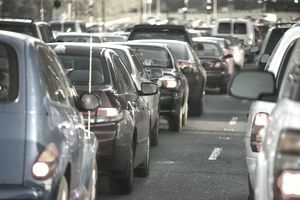 The upshot of this exclusion is that you need commercial auto coverage if you own a vehicle larger than 10,000 pounds. You also need this coverage if you use any size vehicle for delivery purposes or for transporting property. Auto Business Exclusion This exclusion applies to autos used in a business that involves selling, repairing, parking, storing or servicing autos. Examples are a dealership and a repair shop. If you use any vehicles is this type of business, you need commercial auto insurance. Livery Exclusion Virtually all personal policies exclude the use of an auto (truck or private passenger type) for transporting people or property for a charge. Examples are taxis and autos used to deliver pizza or packages. This exclusion also applies to vehicles used in rideshare businesses like Uber and Lyft. The "commercial auto" exclusion is open to interpretation. However, if you use a small truck or van for making deliveries to customers or for hauling tools to a job site, you should seriously consider purchasing a commercial policy. No Automatic Coverage A personal auto policy limits coverage to vehicles listed in a schedule. It affords very limited coverage for vehicles you acquire during the policy period. In contrast, a business auto policy can automatically cover any vehicle you obtain during the policy period. Limited Hired Auto Coverage Under a typical personal auto policy, rental vehicles are covered for physical damage only if you have purchased physical damage coverage for autos you own. Under a business auto policy, you can purchase physical damage coverage for hired autos only. A business policy also covers loss of use expenses and transportation expenses. Most personal policies don't include these coverages. Less Flexibility A personal auto policy lacks the flexibility of a commercial policy. A business policy can be tailored to meet your needs through the use of covered auto symbols and endorsements. Besides the policy provisions themselves, you also need to consider your insurer's stance on insuring business risks. Each insurer has its own rules. You need to be aware of them before you buy a policy, not after you've had an accident. Your insurer may be agreeable to covering some types of business-use autos but not others. Note that most personal auto insurers will not issue a policy covering autos registered to a business (other than a sole proprietorship). If your vehicles are registered in the name of a corporation, partnership or other type of business entity, you will need to purchase commercial auto coverage. Finally, most personal auto policies do not provide a liability limit that is adequate for a business. The maximum limit available from a personal auto insurer is typically $500,000. Commercial auto insurers, on the other hand, readily provide a $1,000,000 auto liability limit. Don't skimp on liability insurance! It is money well spent. A single accident involving a serious bodily injury could result in a huge liability claim against you. If you don't have adequate liability insurance, one claim could put your firm out of business.